Island Tidings » Wild Animals? Hardly. 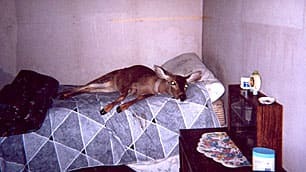 Janet Schwartz of Ucluelet, Vancouver Island, is about to have her pet doe seized by misguided local wildlife authorities. This is a very sad tale indeed. Ms. Schwartz rescued it as a fawn after it was orphaned five years. The black-tailed (mule) deer is entirely domesticated: it sleeps on a bed and eats at the table; it dances to music and gives kisses. Ms. Schwartz considers it the child she never had. From the photo, the doe clearly reciprocates her affection. Since we moved to our island four years ago, we have been closely observing several families and generations of mule deer, since my husband, Doug, insists on feeding them, against the advice of a wildlife biologist. The deer are affectionate with one another, have well-defined family structures and are clever – and irresistible – enough to get us to do their bidding. They have become so tame that they come running toward us whenever they hear our voices or venture out the door. They walk onto our slate deck, peer into our windows, and loll about on our law and raised flower beds, waiting for their next handout, chewing their cud or stretched out contentedly asleep. I’m sure if we left our doors open, we, like Ms. Schwartz, would find them living inside with us. Clearly, they are not much interested in being “wild” animals at all. Like the feral peacock who has adopted us, who spends his day peering into our office windows, watching our every move, and who demands kibble by pecking at our windows to get our attention, animals, if given a choice, will opt for a dependable supply of food and whatever comfort, security and affection they can find. I’m no wildlife expert, but the “wild” and “domesticated” animals I’ve come to know all behave in similar fashion. They are stealthy invaders, who want to get as close to us as possible. Our cats are typical. Over the last 10 years and three household moves, they have progressed from an outdoor, heated cat house (due to my cat allergies), to a basement apartment with very restricted access to our living space, to sleeping on or in our bed, where there is now very little space for us. And so it goes. Many millennia ago, our ancestor domesticated cattle, sheep wolves and other animals. I used to think this was quite a feat. Experience has taught me otherwise. If you feed them, they are yours. Anyone can do it! 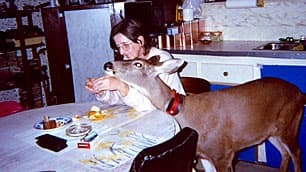 As for Ms. Schwartz and her pet deer, the wildlife authorities should let them be. This deer can no more fend for itself in the wild than I can. It has lost its herd, its extended family, and would wander lonely and alone. Forcing it to give up a soft bed for the cold ground and separating it from its adopted mother would be cruel and unwarranted punishment. Comments Off on Wild Animals? Hardly.